He suggested that the scenario involving "a full failure of the referendum" was a likely one. The opponents of the EU-Ukraine association agreement are most likely to win the Dutch referendum on the EU-Ukraine association agreement scheduled for 6 April, Oleh Ustenko, executive director at the Bleyzer Foundation, has said at the roundtable entitled "Is the Dutch referendum an attempt to stop Ukraine's European integration?" organized by Gorshenin Institute. He outlined three possible ways in which he thinks the situation can develop. "The first scenario is if the referendum fails to take place, which means the number of participants is less than 30 per cent. This is the least painful scenario for Ukraine and the EU. The second scenario is when the referendum takes place with more than 30 per cent going to the polls and most voting in favour of Ukraine. This scenario is not bad for Ukraine but it is not so good as the first one. The third and the least positive scenario is when the referendum takes place and the majority votes against," he said. 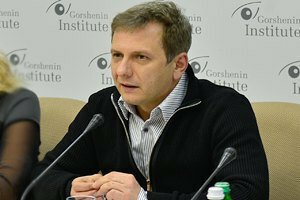 In his opinion, the first scenario is least probable while the third scenario is most likely "not because there is something wrong about Ukraine but because they have their own views and do not understand what they vote for". He added that if the referendum failed, it would be a bigger problem for the EU than for Ukraine because Brussels would have to build relations with eurosceptics.